HTC's next flagship smartphone has already leaked online a few days ago when someone published no less than three promo adds showing some of the main features of the One M9. 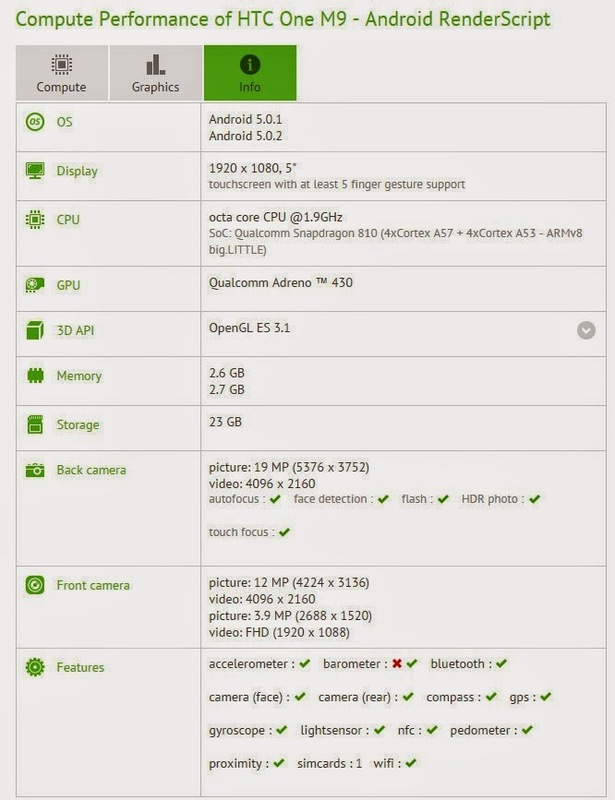 Previous to yesterday's leak, we received many details on HTC One M9's specs sheet. Although they haven't been confirmed by the Taiwanese company, it does seem multiple sources in the industry agree on the same set of hardware packs in the One M9. Now, a new benchmark confirms what we've been reported for the last couple of weeks. Dutch blog Mobifo reports HTC One M9 has been listed at GFX Bench and besides the benchmark scores we also get to see the phone's specifications. Unfortunately, there's no way we can confirm this is indeed the HTC One M9 being test, and we definitely can't assume that this is the final version of the smartphone. However, it might be one of the prototypes that's more closer to the final build. That being said, it appears that HTC One M9 will indeed be equipped with a 2.GHz 64-bit quad-core Qualcomm Snapdragon 810 processor inside, an Adreno 430 graphics processing unit and 3GB of RAM. The tested version packs 32GB of internal memory, but shows only 23GB user-available which is quite standard for Android smartphones with that amount of storage. HTC One M9 will be officially unveiled this weekend, on March 1, so stay tune for more updates on the matter.